It's not much, but it has a mech with an electrified sword, so it'll do for now. 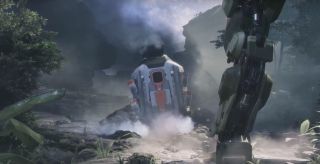 EA has let out the briefest of teasers for Titanfall 2 ahead of a full reveal on June 12—the opening day of its not-E3 conference. Like its predecessor, it's coming to PC. We knew Titanfall 2 was on the cards, of course. Respawn confirmed it this time last year, references kept popping up in financial reports, and a press release from McFarlane Toys announced that Titanfall 2 figurines would be coming winter 2016. No one said anything about swordplay, however.